Lentil – Dal Curry Recipe, Sri Lankan Way is a delicious daal an example of #Sri Lankan cuisine. Sri Lankan Cuisine is a melting pot of flavours that includes colonial powers, foreign traders and the Southern India and so it is distinct. The use of rice, coconut and especially spices, reflects the island nation’s history as a spice producer and trading post over several centuries. 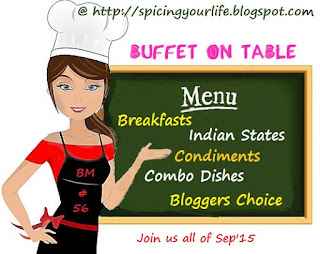 So today along with #Pumpkin Curry, #Lulu Miris and #Senni Sambol let’s try Lentil – Dal Curry Recipe, Sri Lankan Style as we #Blogging Marathoners bring amazing flavours to the “#BuffetonTable ” . I have adapted the recipe from here. This Dal recipe tastes amazingly delicious. My girls just loved it. Rinse the lentils in cold water until clear. Place in a medium saucepan and add the water, coconut milk, turmeric powder, salt, dalchini/cinnamon, tomatoes, and green chillies and curry leaves. Bring to a boil and simmer until the lentils are cooked. Do not cover the dal as it may spill over. In a kadhai/wok, heat the ghee or oil on high heat till just beginning to smoke. Add the mustard seed and cover with a cover to prevent splattering. Once the seeds have crackled add the onions, garlic, curry leaves and the dried red chillies. Reduce the heat to medium and fry till the onions turn a golden colour. Take care as the tadka may burn. Add the lentil mixture to the sautéed spices and allow to simmer gently for a couple of minutes. Add lime juice and adjust the seasoning with salt. The lentil or dal curry is ready to be enjoyed as an accompaniment to rice. so much similar to our sambar!! very flavorful!! Bookmarking Archana, a new Daal is always welcome. Aww, coconut milk in dal, wow arch i m just imagining the flavors, i want to try this!! will let u know how it turns out!! Yummy looking Sri Lankan lentil dish. Looks awesome. Dal,Comforting food of all time..Looks Yum.